What are Eaton Extensions for IBM Director? How can I obtain a copy of the Eaton Extensions for IBM Director software? What versions of IBM Director are supported? What will I need to run this software? What are the system requirements? What are the features and benefits of this product? What does the User Interface look like for this product? Where can I get more information on this software? 1. What are Eaton Extensions for IBM Director? Eaton Extensions for IBM Director provide seamless integration of Powerware uninterruptible power systems (UPSs) into the Director management system. As a part of Eaton's comprehensive family of power management applications, the Extensions for IBM Director simplify network management tasks for critical elements of server power protection. System administrators can easily monitor, diagnose, configure, set alarms, schedule self-tests, check battery, gather inventory information, and control Powerware UPSs network wide from a single console within IBM Director. With Eaton Extensions, users can simply double-click the icons for UPSs integrated into the Director interface, and launch Eaton’s LanSafe or ConnectUPS Web/SNMP Card applications. All the powerful features and functions of these Eaton award-winning applications are now just a click away through IBM Director. 2. How can I obtain a copy of the Eaton Extensions for IBM Director software? To download fill in your registration information and continue to the actual download area. After downloading, follow the installation and configuration instructions in the User Guide. 3. What versions of IBM Director are supported? Eaton Extensions for IBM Director software is available for both IBM Director 3.1 and IBM Director 4.1. The two software products are not interchangeable. 4. What will I need to run this software? What are the system requirements? IBM Director 3.1 or above must be installed in accordance with IBM requirements and procedures. Microsoft SNMP Service installed and running. Microsoft SNMP Trap Service stopped. Microsoft SNMP Trap Service set to Disabled or Manual. Computer is configured to discover SNMP devices. To monitor LanSafe systems, LanSafe must be installed. For LanSafe III, v. 4.17 3a or higher is recommended. Configure system to forward SNMP traps to the Director Server. A web browser must be installed on the computer that will monitor and control the UPS. Download the Netwatch Clients software. Set ”Write Access Managers” to include the Director Server. Set ”Trap Receivers” to include the Director Server. 5. What are the features and benefits of this product? Allows administrators to monitor UPSs in the network, in real-time and obtain advance notice on critical elements of server power management, such as UPS battery status, load level, temperature and alarms for battery replacement. Launch LanSafe and Web/SNMP Card UPS applications from within Director. Enables maximum systems availability through the IBM Director User Interface. Perform UPS inventory queries network wide. Create custom reports on UPS locations, models, serial numbers, firmware versions, equipment attached to UPSs and other details. Control UPS Load Segments – individual receptacle groups. Increase run time by up to 50% on mission critical loads. Switch different UPS loads on and off at predefined times or power failure situations. Command UPSs to reboot specific computer systems or internetworking devices either locally or remotely over the network. Initiate scheduled shutdown/reboot tasks with integrated UPS applications. Test battery health for all UPSs throughout the network. Compatible with the industry standard RFC1628 UPS MIB. Eaton proprietary XUPS.MIB is provided for extra functionality like e.g. load segment control. Control and manage the UPSs on the network via SNMP with the SNMP “GET” and “SET” commands. Forward SNMP Traps from IBM Director to other Network Management Systems. Log all or only predefined UPS events network-wide in a central IBM Director log. Enables Director tools and agents to integrate with Tivoli®, HP OpenView, Microsoft® SMS, CA Unicenter, BMC, NetIQ® and Intel LANDesk® management systems. Ensures compatibility with IBM Director solutions. 6. What does the User Interface look like for this product? IBM Director Console(4.1) with Eaton Extensions installed. LanSafe v. 5 also shown. 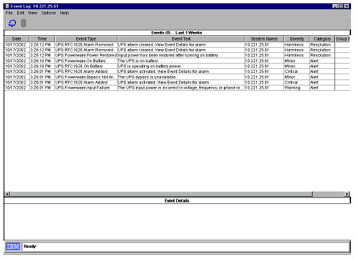 IBM Director Event Log displays events that have occurred on all the UPSs on the network. 7. How much does this software cost? Eaton Extensions for IBM Director is a free-of-charge software solution. 8. Where can I get more information on this software? The User Guide for this software is the best source for additional information. It can be easily located on Eaton's Web site by clicking the 'Product Literature' link at the top right of this page.